I drank way too much eggnog as a kid (with help from my Dad). And I am talking about the full fat-full flavor kind. I can probably attribute the fact that I can no longer stomach that rich seasonal beverage to this overindulgence. However, I do still enjoy the flavor and smell of eggnog. As soon as I saw this recipe, I knew I was going to be able to enjoy eggnog again, albeit in a different form. For the crust, the original recipe called for two sleeves (about 18 whole crackers) of graham cracker crumbs, but I used a mixture of graham cracker crumbs and gingerbread crumbs because I wanted a little spice. 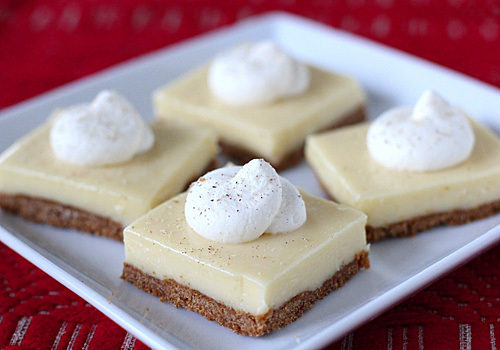 The cheesecake part comes from the addition of cream cheese and mascarpone cheese (good pairing) while the eggnog like flavor comes from the addition of rum and brandy from which the alcohol is cooked out once heated. Once chilled, the bars are cut and garnished with lightly sweetened whipped cream and a sprinkle of freshly grated nutmeg. Once cut into bars (the recipe makes twenty-four nice-sized bars), these are ready to eat with a fork. Cut them smaller and they make for a tasty addition to a holiday dessert table where guests can simply enjoy a bite-sized treat. Preheat the oven to 350º F. Line a 9 x13-inch baking pan with parchment paper leaving overhang to allow for easy removal. In the bowl of a food processor, pulse the graham crackers and gingerbread cookies until finely ground. Add the melted butter and brown sugar and pulse to combine. Press the mixture into the prepared baking pan and bake for 15 minutes, or until set; cool to room temperature. In a small bowl sprinkle gelatin over rum and brandy; set aside. In a separate medium bowl, whisk together 1/2 cup granulated sugar and egg yolks. In a medium saucepan, heat cream, milk, and remaining 1 1/2 cups sugar over medium heat until sugar is dissolved and steam begins to rise. Temper the egg yolk mixture by slowly ladling half of milk mixture into the yolk mixture, whisking constantly. Slowly pour milk-yolk mixture back into saucepan. Continue cooking until the mixture thickens and coats the back of a spoon, about 5 minutes. Off the heat, whisk gelatin into milk-yolk mixture. Cool to room temperature; stirring occasionally. Beat cream cheese and mascarpone in a bowl with a hand held mixer until smooth. Gradually add the cooled milk-yolk mixture, scraping down the sides and beating until smooth. Strain the mixture over a bowl through a fine mesh sieve; whisk in the nutmeg. Pour the mixture over the cooled crust. Chill until set. Using parchment overhang, gently remove and transfer to a cutting surface; cut into 24 bars. In a medium bowl using a whisk or hand held mixer, beat the heavy cream and sugar until soft peaks form. Dollop or pipe the whipped cream onto the bars. Sprinkle the bars with freshly grated nutmeg. Serve chilled. Bars can be kept in the refrigerator without whipped cream garnish for up to 3 days. Enjoy! Yum, this is on my list to make. What a beautiful dessert. These look dangerously, dangerously good. Thank you! I totally get the same with bananas - now I cannot eat them on their own. I'm a little weary of the richness of eggnog on their own, but I enjoy the flavour. I'd love to try your recipe this Christmas. I am with you on the bananas, as well. Enjoy the recipe! I've always adored eggnog! But never used it in any of my baking goods... would have been lovely with cheesecake! 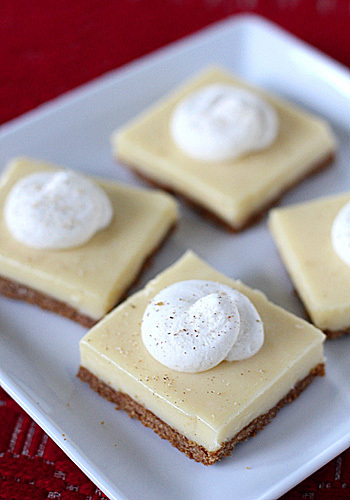 Eggnog and cheesecake. Two of my favorites. Saving this to make soon!